The dried seed spice of a flowering herb native to the Mediterranean and Indian Subcontinent. Cumin is commonly used in Indian and Latin American cooking, either whole or ground. It is the second most popular spice after black pepper. It is used to make adobos, sofrito, garam masala, curry powder, and bahaarat dishes. It is well known for its medicinal properties in India and many other Asian countries. A native of the land of Mediterranean, Jeera is now grown mainly in India, Egypt, Syria, Turkey, China and parts of America. A speed spice, Jeera is grown mainly in hot climatic conditions. Cumin was popular in ancient Roman cuisine. India is the largest producer and consumer of Jeera in the world. Indian output is currently estimated to be around 200,000 ton per year. Cumin seeds resemble caraway seeds, being oblong in shape, longitudinally ridged, and yellow-brown in color. This is not surprising as both cumin and caraway, as well as parsley and dill, belong to the same plant family (Umbelliferae). 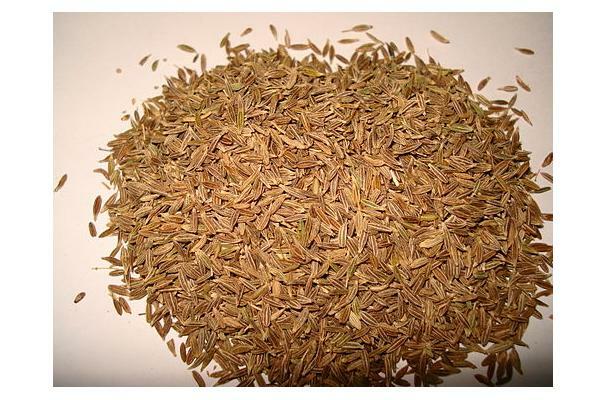 Buying: Cumin seeds are now widely available in supermarkets or in local spice stores. Cumin seeds can be used whole or ground and are traditionally added to chilies and curries. Lightly roasting the cumin seeds before using them, helps bring out the fullness of it's aroma and flavor. Cumin seeds should be kept in an airtight glass container, in a cool dry place. Whole cumin seeds can stay fresh for a year. History: Cumin has been in use since ancient times and have been found in some ancient Egyptian archaeological sites.